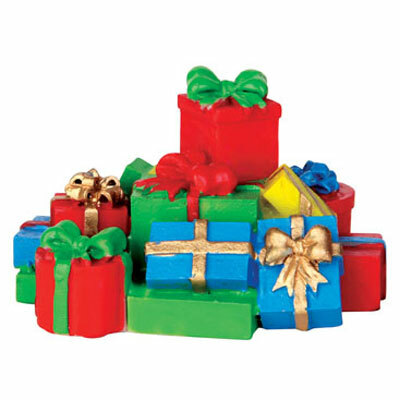 Lemax Stack of Presents Accessory depicts a colourful pile of pre-wrapped Christmas gifts with bows. Suitable for placement in and amongst a Lemax Christmas miniatures setting. A recent Lemax Caddington Village miniature accessory joining the Lemax collection in 2014. Stack of Presents is an individual hand painted Lemax Christmas collectors piece to compliment your seasonal Lemax Village display.